Northwestern University Press, 9780810129276, 176pp. 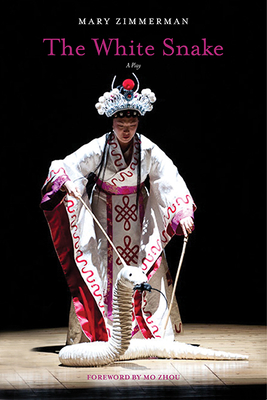 In her latest theatrical production inspired by a classic story, Mary Zimmerman reimagines The White Snake, an ancient Chinese legend in which a snake spirit transforms herself into a beautiful woman in order to experience the human world. Adventuring down her mountainside with her companion, Green Snake, White Snake meets and falls in love with the humble, virtuous Xu Xian and convinces him to marry her. Together, the three friends open a pharmacy, but soon the remarkable healing powers of White Snake draw the attention of a treacherous monk, Fa Hai. Outraged at the union between a mortal and a snake spirit, Fa Hai takes it upon himself to destroy it. Zimmerman brings to this timeless romance her usual brilliant mix of ingenious stagecraft, song, abundant humor, and compassion. Mary Zimmerman's credits as an adapter and a director include "Metamorphoses, The Arabian Nights, The Odyssey, Journey to the West, " and "Argonautika" (all published by Northwestern)."" Her work has been produced at the Lookingglass Theatre and Goodman Theatre of Chicago; on Broadway at Circle in the Square; in New York at Second Stage, the Brooklyn Academy of Music, and the Manhattan Theatre Club; and at Berkeley Repertory Theatre and other theaters around the country and abroad. The recipient of a Tony Award for her direction of "Metamorphoses" and a John D. and Catherine T. MacArthur Fellowship, Zimmerman is a professor of performance studies at Northwestern University.